Jon was invited to talk to delegates in a break out session, and set up a mini exhibition demonstrating how his work had changed over the past 17 years, with particular focus on how his social engagement has effected his exhibition work. 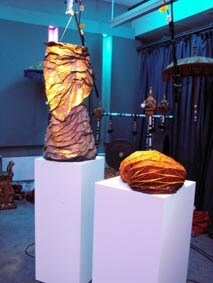 Jon shared the exhibition space with the textile artist Arantza Vilas. Check out her fabulous textured sculpture (pictured above) and website :http://www.blogger.com/www.pinakistudios.com .